TV Plumbing offers a wide variety of options to improve the quality of water - from filtration to conditioning, call today for all your Los Angeles water filtration needs. Some types of water contaminants may need other solutions. You'll first need to see which contaminants are in your water in order to address the major concerns. A whole house water filtration system filters the water effectively, removing particles that would otherwise enter your drinking water. They can also eliminate smells and restrict germs. A combination of water systems can include filtering equipment or the filtration system can stand alone to reduce some particles. No matter what type of water system your Los Angeles home needs, TV Plumbing is here to help. Whether you need testing, installation, or replacement, give us a call today to see how we can help you get the most from your Los Angeles water system! The certified plumbing specialists at TV Plumbing provide Los Angeles homeowners with water conditioning products and services. Water conditioning, or water softening, involves removing hard water-causing minerals from your home's water supply. Calcium and magnesium, which are minerals that are naturally present in municipal and all other fresh water sources are exchanged for sodium. This process "softens" the water in your Los Angeles home, improving water quality. With any type of water conditioner, it's important to keep maintenance up. 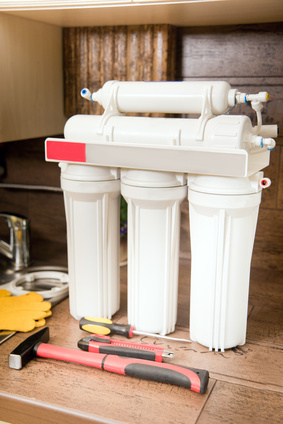 As the water softener processes gallon after gallon of hard water on a daily basis, the treatment capability of the softener becomes depleted and must be recharged or regenerated. Our Los Angeles Plumbers can help you keep your water system well-maintained all year long. We offer installation and repairs as well as regular maintenance, so you'll never have to be worried about finding someone when you need them. Regenerating your Los Angeles water conditioner unit requires a large quantity of sodium-rich water, called "brine". This substance must be properly disposed of once it has been depleted. In Los Angeles area homes with on-site septic systems, this brine flows into the septic tank and eventually makes its way to the system's drain field. Let the experts at TV Plumbing walk you through the water conditioning installation and maintenance process, so that you can decide if water softening is right for your LA home.